Earlier this year, AOL purchased the Huffington Post for $315 million dollars, virtually guaranteeing the site's place among the corporate news pantheon of the Internet, as well as unleashing a lot of hurt feelings and people looking to cash in on this deal. The latest exhibit in the latter category is Jonathan Tasini, an unpaid freelance blogger for the Huffington Post who filed a class action lawsuit against the publication on Tuesday, asking for a third of the money from the AOL deal to go to these bloggers who post to the site. Let's get this straight - no one aspires to become a writer, let alone a blogger, for the money. Tasini himself had been blogging for the Huffington Post since its infancy in 2001, and many others have voluntarily elected to do what he does. Unpaid blogging can be done for any number of reasons - padding for the resume, experience in the field, a way to increase one's readership, a forum to voice one's opinions, or (in my case) a hobby and creative outlet. Tasini knew from the start that he would not be getting paid for his work and, as his decade-long connection to the Huffington Post demonstrates, he must have been okay with this. It is unlikely that Tasini is going to walk away with any money, let alone a third of the profit from the Post's sale. And Tasini himself understands that; he acknowledges that he is not suing because of a breach of contract. In fact, it's sort of unclear what Tasini's actual argument is, besides the fact that its unfair that Arianna Huffington walks away with so much money on the backs of her unpaid writers. What is his game plan here? Does he have a strategy? No, Tasini is not completely crazy, and he wants to get something out of this lawsuit, but it's probably not money. Rather, Tasini seems to be savvy enough to realize that this lawsuit will get a lot of press, and provide him a forum to raise his objections to the Huffington Post. Like it or not (and I don't like it), Arianna Huffington has worked to change the nature of online news media. All those news aggregators and collections of other people's headlines from respected news outlets? That's thanks to Huffington. The focus on keywords and search engine optimization to draw in unsuspecting Googlers? That's also thanks to the HuffPo. The website has been developed not around particularly original content, but a combination of shrewd business acumen and a political zeitgeist that allowed Huffington to latch onto Obama and the Democrats in the same way she latched onto Ronald Reagan and the Republicans in the 1980s. The site functions more as a political weathervane than a firm ideological statement. "We are going to make Arianna Huffington a pariah in the progressive community. No one will blog for her...We will picket her home. We're going to make it clear that, until you do justice here, your life is going to be a living hell." 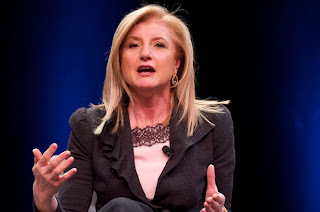 A quote in the New York Times goes even further, in which Tasini submits that, "The Huffington bloggers have essentially been turned into modern-day slaves on Arianna Huffington's plantation." Tasini hasn't quite reached the criteria for Godwin's Law yet, but he's getting close. He's not really looking for $105 million dollars for himself and his fellow bloggers, he's looking for an opportunity to expose the Huffington Post as a collection of mediocre freelance material and links to other people's work, as well pulling back the curtain of European progressivism on Arianna Huffington to reveal her as a money-grubbing capitalist just like the rest of us. Because Huffington herself is not a hero in this story either. Tasini's case has no legal merit, but he's certainly correct that Huffington is only playing the part of a hip liberal - she supported Newt Gingrich in the nineties, for God's sake. Most discerning individuals already realized that her compassionate progressive stance was really a way to cash in on the Obama generation, and now Tasini is putting his reputation on the line to call her out. And here, he may succeed, not by winning any lawsuits, but by pointing out that Huffington's progressive empire rests on her profiting off unpaid workers. "The key point that the lawsuit completely ignores (or perhaps fails to understand) is how new media, new technologies, and the linked economy have changed the game, enabling millions of people to shift their focus from passive observation to active participation - from couch potato to self-expression. Writing blogs, sending tweets, updating your Facebook page...are options made possible by new technologies. The same people who never question why someone would sit on a couch and watch TV for eight hours straight can't understand why someone would find it rewarding to weigh in on the issues - great and small - that interest them. For free. They don't understand the people who contribute to Wikipedia for free, who maintain their own blogs for free, who tweet for free, who constantly refresh and update their Facebook pages for free, and who want to help tell the stories of what is happening in their lives and in their communities...for free." The message is, not only do I pay my bloggers nothing, not only do they like to work for free, they should be glad I'm giving them the opportunity to write at all. Huffington is pulling the hip young liberal card, pretending to act all excited about a Web 2.0 techno-utopia, a digital republic of letters in which she provides a forum for young idealists to exchange ideas. Her case might be stronger if she wasn't raking in millions of dollars by doing this, and if she didn't have a history of changing her political opinions in order to make a buck. Tasini's lawsuit is groundless; he agreed to write for free, and he knew that full well going into that position. But that doesn't mean Arianna Huffington is a benevolent benefactor who just wants to let people showcase their writing skills. If they wanted to do that, Livejournal is still around. If, tomorrow, the editors of Charge Shot!!! informed me that the blog had been sold to AOL for $300 million dollars, and while I'm not getting any money I should be happy that they let me write for them in the first place, I'd be understandably upset and feel a little ripped off. (This is not a possibility, of course, as the editors of this esteemed blog are all more respectable figures than Arianna Huffington). Tasini doesn't have a legal argument, but he does have a moral one - Arianna can't pretend to be the grassroots blogging queen while scoring hundreds of millions of dollars from AOL and insisting her writers are grateful that they don't get a paycheck.